Have you ever eaten skunk cabbage (Symplocarpus foetidus)? I’ve always wanted to try it, and recently I finally did. For a photograph representing the ideal stage for harvesting, click here. I boiled the leaves in 3 changes of water (bringing water with leaves to a boil for 5 minutes, discarding water, adding new water, repeating a few more times). Why is this necessary? Skunk cabbage contains a very high concentration of calcium oxalates which will burn and inflame the mouth. Rapid boiling can be used to dissolve the calcium oxalate crystals. After 3 changes of water, the skunk cabbage showed no signs of having any detectable calcium oxalate crystals. The greens shrunk a whole lot, and if I were to do it again, I’d use more greens! They were mild (what else could I have expected after 3 changes of water? ), though they had a great texture… almost like Brussels sprouts. As I write this, the last week of April is upon us. 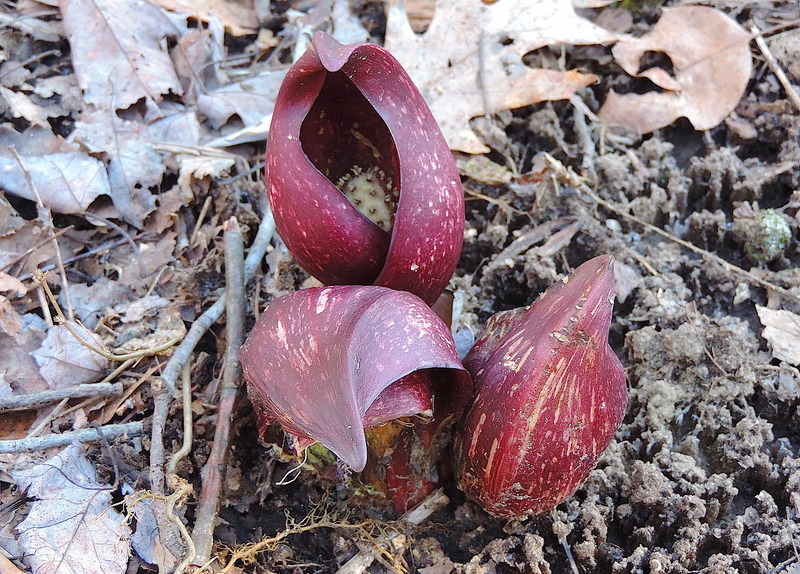 The prime stage for harvesting skunk cabbage, unfortunately, may have already come and gone. Keep this information handy for next year though, and you’ll haven plenty of greens to dine on between the weeks of March and April.